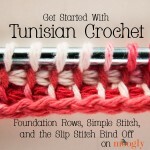 Tunisian crochet can be intimidating, but once you jump in, it’s not so hard! And once you’ve got the basics, you might find yourself exploring new stitches – and the Tunisian Top Stitch, aka the Tunisian Bump Stitch, is a fun and easy variation to try! I used the Tunisian Top Stitch/Bump Stitch to design the Top of the Tunisian Infinity Scarf, and hope to use it again in the future! I was playing around with Tunisian stitches and came up with this idea of going into the top bump – I think it creates a great looking, supremely drapey fabric! But I couldn’t find a record of this stitch anywhere, and asking other designers, they hadn’t seen it either. So I needed to name it myself, and called it the Tunisian Top Stitch, abbreviating it as TTS. Then a commenter on the pattern told me she’d seen it one other place, called the Tunisian Bump Stitch, or TBS. 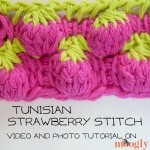 No matter what you call it, it’s a fun stitch to make, and I hope you enjoyed this tutorial! 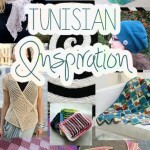 Tunisian Crochet: Get Inspired and Try It Today! That’s fantastic Dee2!! Thank you! Beautiful stitch… what size hook did you use? Sorry, I see that you said it was a P hook. I’m going back to bed … this just isn’t my day… It is a 9mm hook, an M not a P.
😀 I’ve had a few days like that myself lately! I can’t find the yarn locally, only online. What is a good substitute that I may be able to get at Joann’s, Michael’s or Beverley’s? How to change color in the middle af a top stitch row? Can it be done, so it looks OK on the back of the work? 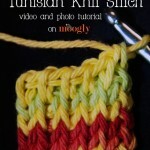 Check out the “Encyclopedia of Tunisian Crochet” by Angela “ARNie” Grabowski, p. 37, which deals with crossbar stitches. This fact will date me, but here goes. Back in the early 1980’s I purchased a 6 page, 8.5 in by 11 inch instruction pamphlet, that calls this stitch the “Tunisian Bump Stitch”. The first paragraphs tell that the author learned it from a neighbor’s mother who was from one of the Central Asian countries. 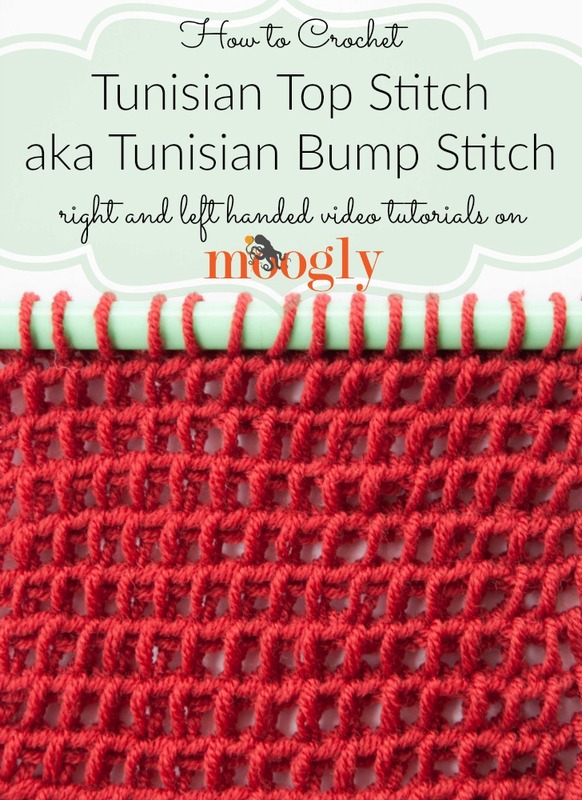 It was known as the “bump” stitch because it looks like the hump on the back of a camel and was a Tunisian stitch variation. It was separate from the TSS stitch and when worked TSS produced a crochet fabric that curled. She said that if one wanted a thick and very warm covering, the stitcher would used the TSS to crochet it. If the covering was to be less warm, then the bump Tunisian stitch was used. At 74 that is all I remember, not who the author was or which company published the pamphlet. I still use it myself over all my years.